This is the default mode, also called Infrastructure mode. Your router acts as an central connection point, which wireless clients can connect to. Client: The radio interface is used to connect the internet-facing side of the router (i.e., the WAN) as a client to a remote accesspoint. NAT or routing are performed between WAN and LAN, like in "normal" gateway or router mode. Use this mode, e.g., if your internet connection is provided by a remote accesspoint, and you want to connect a subnet of your own to it. Client Bridged: The radio interface is used to connect the LAN side of the router to a remote accesspoint. The LAN and the remote AP will be in the same subnet (This is called a "bridge" between two network segments). The WAN side of the router is unused and can be disabled. Use this mode, e.g., to make the router act as a "WLAN adapter" for a device connected to one of its LAN ethernet ports. Repeater: The radio interface is used to repeat an existing access point signal. The LAN and the remote AP will be on the same subnet and will have the same SSID's. This is useful if you have a weak signal in your house and want to "boost" it to another part of the house by adding a DD-WRT router and putting it in Repeater mode. So, when do you use these? If you are using the router as your primary router / wireless access point, put the mode inAP, give it an SSID and call it good. This will make the router act like a "normal" wireless router. If you are wanting to boost a weak signal from your primary access point, add a DD-WRT router and put it in Repeater mode and type in the exact name of the access point you are connecting to. Client and Client Bridged mode is when you want to turn your DD-WRT device into a "client." A client is a computer, printer or any device that connects to another access point. With this setting, you can use your router to connect to a remote access point, like your neighbors house (with their permission) and hook your computers up to their network. This is one of the more useful features. Here is an example (though do not take this example as allowed by usage policy for this provider): Let's say you live in San Francisco. That city has municipal hot spots for free Internet. In your house, the signal is too weak to use but if you sit near the window, you get a good signal on your laptop. You also want a home network with multiple computers and printers... You can get a DD-WRT router, put it in client mode and have it connect to the municipal SSID. Don't use "bridged" mode. Now, connect computers, printers, etc to the LAN ports of the router. Your router will serve your personal machines IP addresses from your router but it will go to the Internet via the municipal access point out on the street. >3) For the Wireless Network Name, type in the EXACT name of the wireless system you want to connect to. 5) Save and Apply Settings. You are now connected to another access point. Computers must connect to your router via the LAN ports. You can connect another access point to the LAN ports to create a separate wireless bubble in your house on your network. It is possible to create 2 wireless interfaces with the DD-WRT: 1 for the Internet access and 1 for your local access in your house. This is an advanced topic that has been covered in depth in the forums at DD-WRT and is beyond the scope of this article. 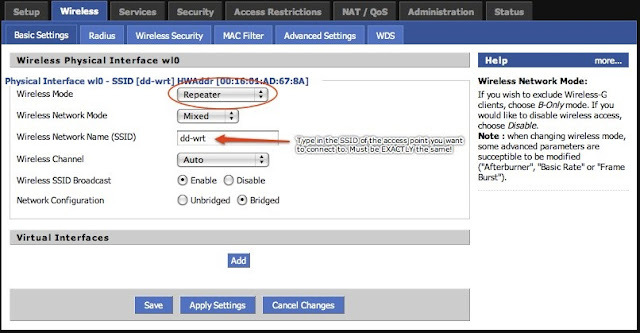 With this mode, your wireless and LA wireless and Ethernet LAN computers will all get IP's from the remote access point and the wireless radio of the DD-WRT will re-broadcast the same SSID as the remote giving you a stronger signal in your house.